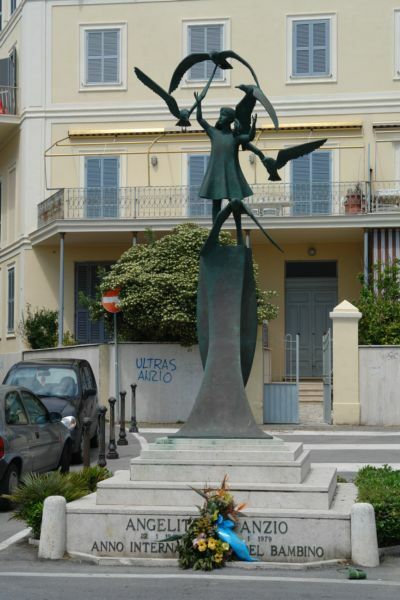 This memorial commemorates Angelita, a young girl found in January 1944 lost and frightened on the beach in the midst of heavy bombing. She was found by S.C. Hayes of the Royal Scots Fusiliers. Hayes and his comrades adopted her for a few days but were unable to locate her family. After some days the men left the child with the Red Cross and just minutes after leaving her, there was an explosion from a shell and Angelita was killed. On 22 January 1979, this memorial was erected for her, and to commemorate all the innocent victims of war. But at the name of Angelita, all the veterans I spoke to looked blank. The man who claimed to have discovered her, Christopher Hayes ------ died two years ago. But the story that he reported lives on. A local historian, Amerigo Salvini, has looked into Mr Hayes's story and believes it is untrue. There are too many variations in detail and improbabilities, he says. "If soldiers found a child they would have handed her over at once to the medical corps," he said.